DALLAS, TX – The plants blooming at Texas Discovery Gardens vividly demonstrate that organic gardening techniques produce beautiful results. The Texas Organic Research Center (TORC) this week designated Texas Discovery Gardens as the first certified organic public garden in Texas. Instead of synthetic fertilizers and pesticides, natural soil amendments are used on the native and adapted plants at Texas Discovery Gardens. 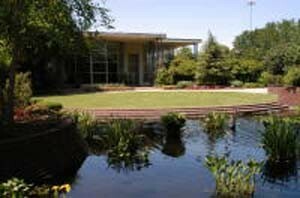 Texas Discovery Gardens is a year-round urban oasis nestled among the historic Art Deco buildings at Fair Park. A beautiful, refreshing destination for local residents and out-of-town visitors, the gardens showcase beautiful native and adapted plants grown using sustainable, organic gardening techniques. Texas Discovery Gardens' mission is to have a positive impact on the future of Texas by teaching people effective ways to restore, conserve and preserve nature in the urban environment through the use of native and adapted plants that illustrate the interrelationship of butterflies, bugs and botany. The organization's educational programs for schoolchildren reach more than 25,000 students annually. The adult education outreach programs serve an equal number of adults in the greater Dallas area. Texas Discovery Gardens is a 501(c)(3) nonprofit organization that is funded in part by the Dallas Park and Recreation Department. Organic programs work better than chemical approaches. Organic solutions are less costly than chemicals. Organic programs are safer and create a more healthful and sustaining environment.